Keep the essentials right at your finger tips. The Banjo Brothers Top Tube Bag is a classic "bento box" style carrier that's perfect for storing smaller items like your cell phone, keys, camera and snacks. 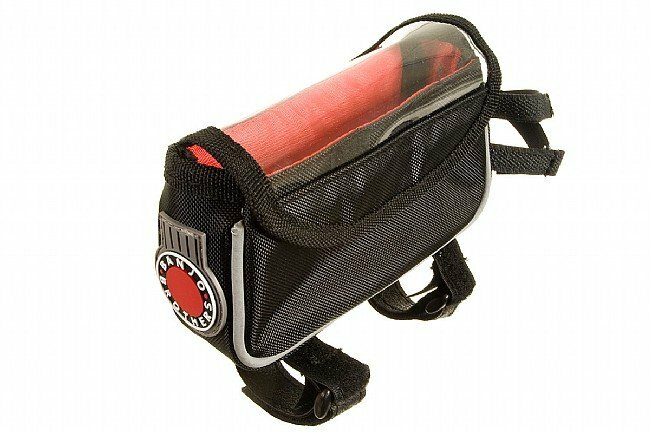 I have been using a fanny pack to carry my (larger) Smartphone, keys, wallet and tissues and wanted to try a top tube bag in its place. The Banjo Brothers Top Tube Bag attached to my bike easily and seems sturdy and well-made. It didn't shift during my ride and was not in the way while pedaling. The hook and loop fasteners were secure throughout the ride. However, the bag is very small. I ended up putting the phone in my trunk bag (which fit in the top tube bag- but not with anything except tissues), the keys in a pocket-leaving my wallet and tissues for the top tube bag. If you travel light it's a great little bag. Looks like I'm on the right track...just need to find something a bit larger. Durable and handy location to keep bike essentials, and fits my iPhone just perfectly. Just perfect for regular size I phone emergency reading glasses a lot more. Very good attachment straps and lid. I shortened mine with scissors where they are extra long. 15 bucks is almost a give away. Far better product than last 40$ bento box that did not fit phone. I attached this bag to my seatpost and top tube. It stays put there, with my cable and lock in it. Very easy to access and has enough capacity. Clear top cover stiffens and cracks after 4-5 years use, otherwise well made bag. We have one on each of our 4 bikes. Very useful and sturdy with minor exception of clear top. Banjo Bros should offer clear plastic or fabric as options. Straps are long as previous reviewer mentions, but scissors easily trim to your needed length. Mounts very securly, pads under bag protect frame from bucklestrap scratches, and we use the extra length to secure a frame mount pump under the top tube. Not suitable for large smartphones. good quality and workmanship. good price also. spent more for lesser quality with other name brands. would buy again and recommend to friends. Great value and quality workmanship. Compared to other name brands with lesser quality and bigger price tags. Would reccomend to friends. This is not shower proof. It's an Ok product but I wouldn't put my cell phone in it if rain is expected. Better to seal items in a baggie then put it in the bag. If the top cover was bigger this wouldn't be a problem. The cover does not stop rain entering along the sides of the bag. I use only for very long rides. It holds a lot of stuff and fits well on top tube. 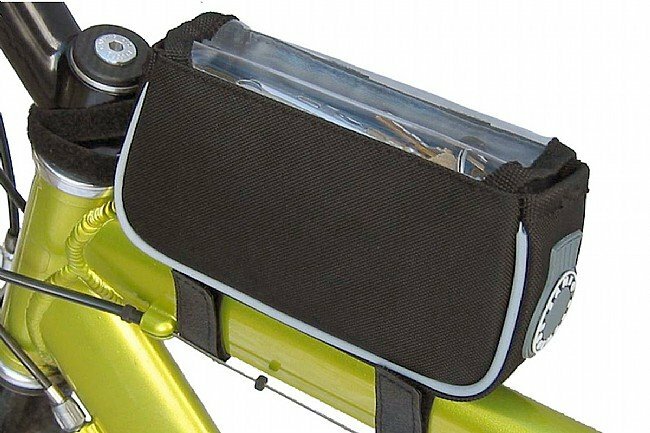 I don't like a saddle mount bag and this is a great alternative but I wish it was slightly smaller. Nice bag, good for small camra or anythong you want to keep handy, Not much to it. smaller than I thought. This is a good fit for cleat covers, i.d., and house keys. I don't have to stuff many things into the jersey pouches. It keeps the under saddle bag for tubes, levers, and inflator. The slim design hides the bag behind the headset and stem. I haven't used it in rainy weather yet so I cannot attest to its abilities at blocking out water. However, the straps that go around the top tube are very long and should work well with pretty much any sized tube. The velcro has worked great so far, I have no fears of the box falling off or shifting much during use. This is a great value and holds a good amount of food. Use it to carry cell phone and topeak alien tool kit & medications. Based on the measurements on the site, I thought it would be slightly larger than an existing one I have. Don't know how the manufacturer arrived at their measurements but it definitely is not as large as I thought it would be. That was disappointing. Overall am pleased, but because it's not as big as I expected, I'm downgrading it one star to 4 stars. I needed a bit more room to stash my phone, nutrition, and car keys. This product fits the bill. While it does not break the bank it has nice construction and the two front Velcro straps are essential in keeping it from listing. It looks water proof, but rain will seep in if it's more that a passing shower.